Entheogen literally translates creating or generating god within, and this ancient knowledge of sacred plant teachers has the potential to transform the world if we can connect with the divinity within and all around. 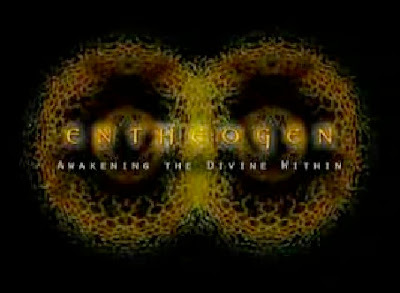 'Entheogen Awakening the Divine Within' is a feature length documentary which invites the viewer to rediscover an enchanted cosmos in the modern world by awakening to the divine within through the ritualistic use of Entheogens or Psychedelics. Stan Grof, Marilyn Schlitz, Ralph Metzner, Alex Grey, Terence McKenna, John Markoff, Daniel Pinchbeck, and Kat Harrison among others, postulate how the disenchantment of the modern world may be remedied by summoning the courage to take the next leap in the evolution of planetary consciousness. The film examines the re-emergence of archaic techniques of ecstasy in the modern world by weaving a synthesis of ecological and evolutionary awareness,electronic dance culture, and the current pharmacological re-evaluation of entheogenic compounds. Within a narrative framework that imagines consciousness itself to be evolving, Entheogen documents the emergence of techno-shamanism in the post-modern world that frames the following questions: How can a renewal of ancient initiatory rites of passage alleviate our ecological crisis? What do trance dancing and festivals celebrating unbridled artistic expression speak to in our collective psyche? How do we re-invent ourselves in a disenchanted world from which God has long ago withdrawn? Entheogen invites the viewer to consider that the answers to these questions lie within the consciousness of each and every human being, and are accessible if only we give ourselves permission to awaken to the divine within. merci ce site est genial!